As many of you are aware, Central Italy has been experiencing a series of earthquakes which began in late August this year. Clusters of earthquake tremors are not uncommon worldwide and are referred to as ‘swarms.’On 24 August, a very serious level 6.2 earthquake occurred in the Sibillini Mountain range of the Italian Apennines. Close to 300-people lost their lives and over 25,000 people either lost their homes or were required to evacuate. Countless businesses were destroyed and lives disrupted in the mountain villages. A contributing factor to the high initial loss of life was the late August period is traditionally vacation time in much of Europe. During this period, it is common for Italians to escape the heat of late summer in the cities to vacation in mountain villages. It is also common to have visitors from outside of Italy come into Italy’s mountains for their vacations. As a result, many small towns and villages were filled to capacity with visitors on 24 August. Regrettably, many of these smaller settlements contained structures built in less prosperous times by people who worked the land and were not constructed in accordance with later, updated building codes more sensitive to seismic issues. After a somewhat moderate quieting down, the so-called earthquake swarm re-intensified adding to the property loss. In late October, more intense earthquake activity was felt in a concentrated area in the Sibillini Mountains. On 24 October, a level 5.5 earthquake occurred followed on 30 October by a 6.6 level event. These tremors intensified property damage in structures already weakened in the previous series of tremors. Fortunately, the Civil Protection authorities had taken prompt and effective action in the aftermath of the initial 24 August seismic shock and had facilitated evacuations in earthquake prone areas where building structural integrity was felt to be compromised. The increase in late October serious seismic activity intensified the evacuation effort and broadened its scope. The evacuees were moved into temporary housing where many still remain. That prompt response has ensured the post-August re-intensification of the earthquake activity has not resulted in the additional loss of life. The issue of how or even whether to rebuild has yet to be addressed. It is understood the Apennine Mountain Range, which runs down the spine of the Italian Peninsula, was formed over geologic time by the dynamic interaction of the Euro-Asia and the African Plates of the earth’s outer crust. The sheer magnitude of geologic forces seems impossible to reduce into terms human understanding can easily grasp. I know I am not alone in finding it difficult to come to terms with the reality that human civilization is perched on incredibly massive, moving chunks of earth’s outer crust. It is understood these large crustal masses are literally colliding with each other in the process of ‘floating’ on hot viscus material. Geophysicists have explained the relentless pressures caused by the interaction of these massive blocks of matter cause buckling near the contact zones that result in the uplifting formation of mountains. Apparently, the seemingly stable earth beneath our feet is anything but stable. The current so-called swarm of earthquakes here in central Italy is occurring along the axis of the Apennine Mountain range some 25-30 kilometers west of Ascoli Piceno. The long axis of the earthquake activity is spread over some 65 to 75 kilometers. Many of the seismic events have generally been below level 3 on the Richter earth movement scale. The more devastating late October event was recorded at 6.6. Keeping that in perspective, the Richter Scale is Logarithmic, that is a level 3 is 10 times more powerful than a level 2. Therefore, the amount of force represented by the 30 October level 6.6 earthquake was enormous. Seismic event epicenters registering below level 3, at distances more than 25 kilometers from Ascoli, are generally not immediately apparent here. However, the October 30th 6.6 event, while more than 40 kilometers from Ascoli, definitely made its presence felt. 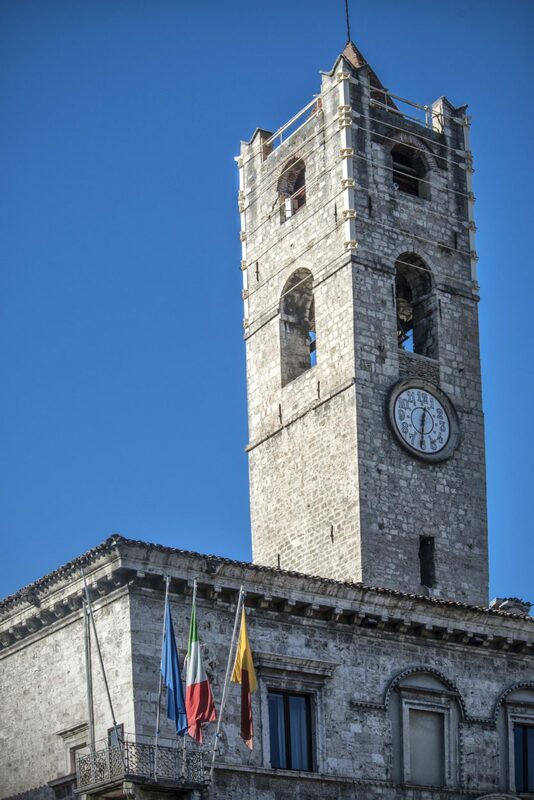 That major tremor resulted in some compromised structural integrity in a few buildings even here in Ascoli prompting limited structure evacuations and temporary closings of public buildings. The series of earthquake tremors, while not individually sufficient on their own to cause widespread serious structural damage in Ascoli, have had a cumulative effect over the protracted seismic activity period of causing evidence of superficial stresses in some building components. Consequently, the landmark thirteenth century tower of the Palazzo di Capitani in Ascoli’s Piazza di Popolo (pictured above, top) has been reinforced by external steel bands as a precautionary reinforcement measure. 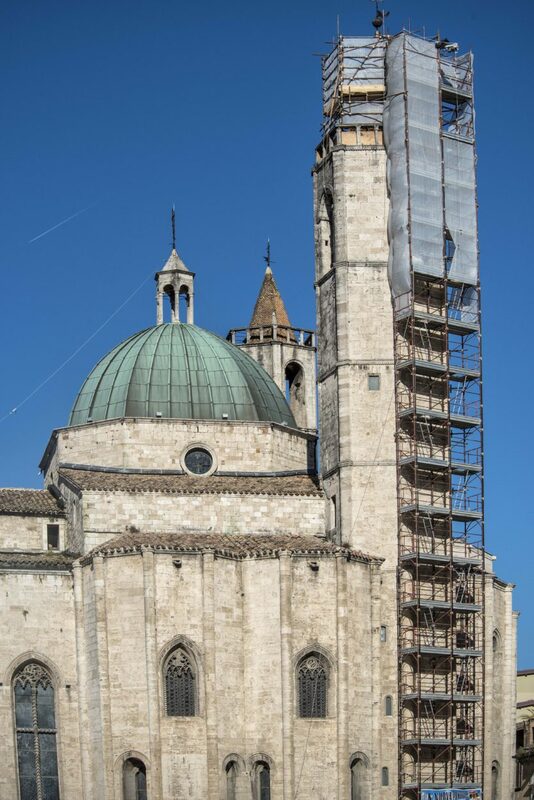 Scaffolding to undertake reinforcing measures has also been erected up the entire height of the bell tower of the Church of Saint Francis which dates to 1152 (shown above in the lower photo). Those familiar with this Blog are aware that we live in an apartment within an old Palazzo which we understand dates to the late sixteen century. This structure is built of massive travertine marble blocks and conveys an impression of solid permanence itself. But even this solid, old structure was seriously shaken in the massive late October earthquake. Some lesser magnitude events that have occurred since have also been felt. From the experience we gained as southern California residents exposed to frequent earthquake events, we understand the greatest risk for structural failure occurs when different elements of a building respond to an earthquake tremor by moving independently and at different rates of reaction than the overall structural mass. The massive structure in which we live has seemed to move as a unit rather than reacting in conflict with its internal parts. While the overall structure of the Palazzo appears to not be showing outward signs of compromise, internally, some of the thick coats of plaster applied to the structural building stone surfaces beneath have shown some signs of stress cracks. There are several in our apartment which are fortunately not matched on opposite sides of the walls and are, therefore, considered to be superficial rather than probable indications of underlying building structural compromise. The higher you go in a building, the greater the movement effect caused by a seismic event and the higher the resulting stresses on interior plaster. In our Palazzo, the cracks in the interior plaster wall coatings on the floor above us are more numerous and wider than in our apartment. Any number of buildings we have visited in Ascoli since the onset of the tremors are showing some of the same kinds of internal stress cracks in the plaster of interior spaces as we see in our Palazzo. More recently, the intensity of earthquake activity being felt in Ascoli seems to have diminished. We are probably clinging to an expectation that this old Palazzo has been through more than one series of tremors in its long life and probably isn’t ready to surrender to gravity anytime soon. Italians are resilient. The sense of community connectivity is also evident as people check on neighbors nearby and their outer circle of connectivity in the aftermath of a strong seismic event. Immediately following a more serious seismic event, Italians come out of their homes at any hour and gather in the main Piazzas for safety and mutual support. No one can say for certain how long the current swarm of earthquakes is likely to continue. The present trend seems to indicate an elongated enlargement of the affected areas to the north and to the south moving the effects of most of the epicenters further from Ascoli. As much as the continuation of detectable seismic activity causes concern, in the spirit of looking for hope where you can find it, I want to believe the pattern indicates a slow and steady application of geologic forces resulting in a larger number of lower intensity seismic events rather than building to a single catastrophic occurence. But if that isn’t an indication of a predisposition for optimism I don’t know what is. How do we feel about all this? Well, the obvious answer is we would like to not have the anxiety just like the rest of our fellow Ascolani. But there is something to a readjustment to human hubris in coming to terms that there are forces of nature that remain totally out of our control. Perhaps there is some healthy perspective to be gained from all that. Do we have second thoughts about being here? No, not a one. Italy and its people have survived worse over the centuries and have responded with resiliency and see community as a vitally important value. Is it still safe to come to Italy? Absolutely! Even with an occasional awareness of some distant earthquake activity, everyday life in Ascoli continues to go on. The Piazzas have been decorated for the Christmas community celebrations. Along with the rest of Italy, this wonderful country continues to remain one of the premier places to visit because of the exceptional concentration of major cultural assets and the outstanding quality of everyday life. Please do not let reports of seismic activity suggest reconsideration of plans to visit here. In addition to the enriching, life enhancing personal experience coming to Italy always involves, in the aftermath of the recent natural phenomena, Italy can benefit from the economic resources visitors bring into this very desirable country. We continue to love it here and have no plans to go anywhere else. It continues to be very safe here. Come join in and enjoy it with us. Grazie Larry e Arlene, la vostra resistenza e la vostra fiducia, l’amore che provate per Ascoli e per gli ascolani anche il questo momento mi commuovono e vi ringrazio per quello che scrivete su questo blog. Vi voglio bene, scusate se non sono venuto al vostro ultimo dell’anno. I forgot to add, in honor of the earthquake victims, I served bucatini ala amatriciano to dinner guests. I researched it to try to make it authentic, it has become one of my favorite dishes. Thank you Kitty for the kind response and your thoughts for the earthquake victims. The local Bishop commented the other days that this was going to be a Christmas not like any other for many in the area. We will be attending a concert this evening the proceeds of which will go toward victim relief efforts. And thank you for retaining enthusiasm to visit Italy. We want others to feel the same. We will be there this summer ,there are forces of nature beyond our understanding and control,anything could happen anywhere anytime. Couldn’t be more excited to travel now that we are retired and plan to be at the Quintana next year. Thank you Larry for the updates and as always we admire you both so much for being such examples of living “La Dolce Vita”. Larry, I think you said it all with ” Italy and its people have survived worse over the centuries and have responded with resiliency and see community as a vitally important value.” You and Arlene are in a good place. Think of you often. Will definitely come to Ascoli again for a visit. Had lots of fun shopping there and seeing your beautiful town and meeting your new neighbors. BTW: Many years ago in response to the major earthquakes that occurred in California, I did a series of bas relief paintings. As a transplant from the midwest, it was my way of dealing with the anxiety caused by the quakes. We’re due for a major quake here in southern CA sometime within the next 30 years.